Frank Money is an angry, self-loathing veteran of the Korean War who, after traumatic experiences on the front lines, finds himself back in racist America with more than just physical scars. His home may seem alien to him, but he is shocked out of his crippling apathy by the need to rescue his medically abused younger sister and take her back to the small Georgia town they come from and that he’s hated all his life. 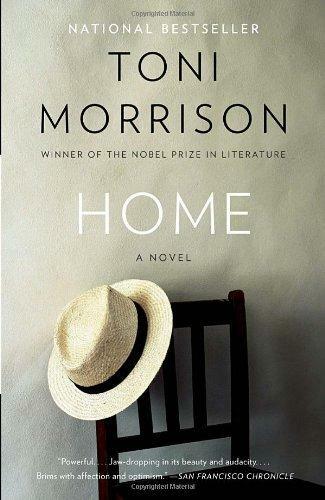 Why has Toni Morrison chosen Home for her title? In what ways is the novel about both leaving home and coming home? What does home mean for Frank, for Cee, for Lenore, for Lily? The race of the characters is not specified in the novel. How does Morrison make clear which characters are black and which are white? Why might she have chosen not to identify characters explicitly by their race? What is the effect of alternating between Frank’s first-person (italicized) narration and the third-person omniscient narration through which most of the story is told? What is the implied relationship between Frank and the narrator? 4. Talking about the horrors of war in Korea, Frank tells the reader: “You can’t imagine it because you weren’t there” [p. 93]. Does the reader succeed in imagining it even though he or she was not there? How close to another’s experience, even those radically unlike our own, can imagination take us? How has Frank’s war experience affected him? What symptoms of post-traumatic stress disorder does he exhibit? In what ways does he suffer from survivor guilt? In what sense can Home be understood as Frank’s confession? In what very concrete ways does Cee’s lack of education hurt her? How might she have been saved from infertility had she understood the implication of the books about eugenics in Dr. Beau’s office? Why do the women who heal Cee have such contempt for “the medical industry”? [p. 122]. In what ways are Frank and Cee both victims of a medical system that puts its own aims above the heath of its patients? Does Home offer an implicit critique of our own health-care system? What methods do Miss Ethel Fordham and the other women use to nurse Cee back to health? Why do they feel Frank’s male energy might hinder the healing process? What larger point is Morrison making about the difference between feminine and masculine, or earth-based and industrial, ways of treating illness? Frank doesn’t know “what took place during those weeks at Miss Ethel’s house surrounded by those women with seen-it-all eyes,” only that they “delivered unto him a Cee who would never again need his hand over her eyes or his arms to stop her murmuring bones” [p. 128]. In what ways is Cee transformed by the treatment, and the wise counsel, that Miss Ethel gives her? Both Frank and Cee were eager to leave Lotus, Georgia, and never return. Why do they find it so comforting when they do go back? What is it about the place and people that feels to Frank “both fresh and ancient, safe and demanding” [p. 132] and makes Cee declare that this is where she belongs? How have Miss Ethel and the other women in her community learned not just to live with but to rise above the limitations imposed on them? What moral code do they live by? Why does Frank decide to give a proper burial to the man killed for sport—and whose undignified burial Frank and Cee witnessed as children—at the end of the novel? Why would this act be emotionally important for him? Why has Morrison structured the novel so that the end mirrors the beginning? The flowering lotus is a plant of extraordinary beauty, but it is rooted in the muck at the bottom of ponds. In what ways is the fictional town of lotus, Georgia, like a lotus plant? Why is it important that Frank does not resort to violence against Dr. Beau? In what ways has Frank been changed by the experiences he undergoes in the novel? Much has been written about racism in America. What does Home add to our understanding of the suffering blacks endured during the late 1940s and early ‘50s? What is most surprising, and distressing, about the story Morrison tells?